Welcome back Robert ! Having first become a CocoPup on Sept. 3, 2005 with Charys, Robert is once again taking a Flagstaff puppy as his guide. Don and Heidi's first puppy Nira is continuing the tradition. Local residents Laureen and Monica raised a puppy for Guide Dogs for the Blind, and recently watched as their dog, Salsa, graduated as a guide. 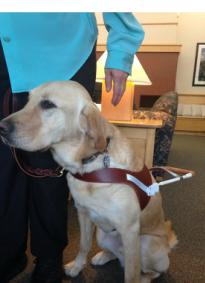 The graduation ceremony was held July 20 at the Guide Dog campus in Boring, OR. The graduates reside in New Orleans where Melissa is a student working on an advanced degree. Flagstaff members of the local Guide Dog Puppy Raising Club, CocoPups were proud to see their dog Fresno graduate as a guide in a formal ceremony at the Guide Dog campus in San Rafael, Calif. on Saturday April 6, 2013. Fresno is pictured with Lee, from Georgia. Prescott Guide Raisers is thrilled to announce Jessa (raised in part with CocoPups in Flagstaff) will be graduating on April 27 from Dogs4Diabetics . Jessa will not only be an active diabetic alert dog, but was chosen by the president of Dogs4Diabetics to be his own personal alert dog as well as an ambassador for the program. We are so proud! 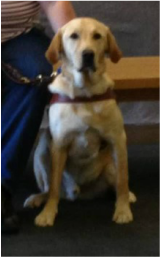 Kent, graduated as a guide dog in a formal ceremony Oct. 29, 2011 at the Guide Dogs for the Blind campus in San Rafael, CA. the local guide dog puppy raising club Cocopups, led by Lareen and Monica . For more information, visit www.guidedogs.com. Laureen and Monica contributed time and love in raising a puppy for Guide Dogs for the Blind and were proud to see the dog, Marcella, graduate as a Guide in a July 16, 2011 formal ceremony on the campus of Guide Dogs for the Blind in San Rafael, CA. The raisers are members and co-leaders of the local Guide Dog Puppy Raising Club, Coco Pups. They would like to extend their thanks to fellow raisers, friends and co-workers at both the Northern Arizona Regional Behavioral Health Authority and the Flagstaff Public Library. Without their support the team of John and Marcella would not have been possible. Guide Dogs for the Blind uses yellow and black Labrador Retrievers, Golden Retrievers and Lab/Golden Crosses as guides. The puppies are born on the campus in San Rafael and placed in the homes of volunteer puppy raisers when they are about two months old. The puppy raisers socialize the pups by housebreaking them, teaching them to be good canine citizens and introducing them to new experiences. 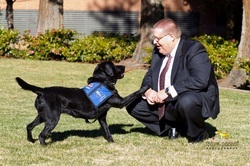 intensive in-residence course culminating with a graduation ceremony at which the raiser formally presents the dog to the dog's new partner, who is blind. Guide Dogs for the Blind has been providing skilled dogs and training free of charge since 1942. They receive no government funding but depend entirely on private donations. For more information, contact Guide Dogs for the Blind at 800-295-4050 or visit www.guidedogs.com. Administration in Las Vegas. Guide Dogs for the Blind uses yellow and black Labrador retrievers, golden retrievers, and lab/golden crosses as guides. The puppies are born at the Guide Dog kennels and placed in the homes of volunteer puppy raisers when they are about 2 months old. Volunteers socialize the pups and teach them to be good canine citizens. Monica and Emma are continuing to be puppy raisers, and are halfway through training Justine, another black Lab puppy. "Our job is to help a puppy become a well-behaved house dog, provide basic obedience training and socialize him extensively to develop his confidence in all situations," said Tammy, the leader of Coco Pups. "That's where our welcoming community is so important to our training." Laureen contributed time and love in raising a puppy for Guide Dogs for the Blind and was proud to see the dog "Sahara" graduate as a guide April 11, 2009 in a formal ceremony at the guide dog campus in San Rafael, CA. Puppy raiser Laureenn is a member of CoCo Pups, the local guide dog puppy raising club, which is led by Tammi. Club members volunteer in a variety of jobs in Flagstaff and Prescott. The volunteers socialize the pups by house- breaking them, teaching them to be good canine citizens and introducing them to new experiences. "Sahara" spent many hours at the gym, shopping and dining in local restaurant and went to work with Laureen to encounter a number of social and training environments. The pups are returned to Guide Dogs for the Blind for formal guidework training when they are 14 to 18 months old. Following the completion of training, the dogs are matched with blind students enrolled at the school. Volunteer Laureen presented "Sahara," a lab retriever to graduating student Sue. 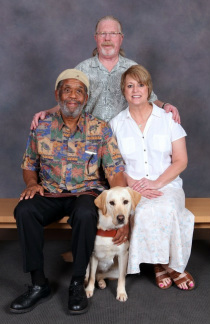 To get involved, call guide Dogs for the Blind at (800) 295-4050 or visit www.guidedogs.com. Jeanne, Don, Monica and Emma Lane contributed time and love in raising a puppy for Guide Dogs for the Blind, and were proud to see their dogs graduate as guides in a formal ceremony at the guide Dog campus in San Rafael, Calif. on Saturday, Nov. 11, 2006. Jeanne, Monica and Emma are all members of the local Guide Dog Puppy Raising Club, Coco Pups. at her office, where he has his own clearance badge. Both Monica and Jeanne were very appreciative of the community support they received: "Our local community was very encouraging and supportive of these young dogs as they socialized and grew into fine working animals. We would also like to extend our thanks to the community for supporting us in our puppy-raising efforts.We are very proud of our dogs!" Guide Dogs for the Blind uses yellow and black Labrador retrievers, golden retrievers, and lab/golden crosses as guides. The puppies are born at the Guide Dog kennels and placed in the homes of volunteer puppy raisers when they are about two months old. The puppy raisers socialize the pups for house-breaking them, teaching them to be good canine citizens and introducing them to new experiences. The pups are returned to Guide Dogs for formal guide-work training when they are 14 to 18 months old. Following the completion of training, the dogs are matched with blind students enrolled at the school. The new person-dog team completes an intensive in-residence course, culminating with a graduation ceremony at which the raiser formally presents the dog to the dog's new partner, who is blind. Guide Dogs for the Blind has been creating lifelong partnerships in the community by providing skilled dogs, and training in their use, free of charge since 1942. The organization receives no government funding, but depend entirely on private donations. To get involved, call (800) 295-4050 or visitwww.guidedogs.com. Jeanne, presented Guide Dog, Honor, a female black lab, to graduating student Sharon. Monica and Emma, presented Guide Dog, Drew, a male black lab, to graduating student Robert. Jeanne and Don were proud of their graduate. On Sept. 3 2005 in San Rafael, CA., they watched proudly as Charys, a yellow Labrador retriever, graduated from Guide Dogs for the Blind training. After the ceremony Jeanne presented Charys, to his new owner, Robert, who has been blind since age 10. Charys is Robert's third guide. volunteers who work under the direction of a trained local leader. Guidance comes also from a district advisor, from twice-a-month outings, occasional state-wide training meetings, and from manuals and communications from the school in San Rafael. volunteer puppy raisers when they are about two months old. Guide Dogs for the Blind uses yellow and black Labrador retrievers, golden retrievers, and Lab/golden crosses as guides. companions, and to socialize them in every way possible to prepare them for work as responsible, focused guides. That means exposing them as widely as possible to places, situations and surroundings that they'll encounter as someone's trusted guide." After about 15 months the dogs are recalled to San Rafael for professional training in guide work. During the five or six months of training, the raisers receive weekly reports as to their dog's progress. About half of the dogs graduate to become guides. They are then matched with a blind partner. At that point, dog and partner undergo a month of intense training together at the school. Puppy raisers are invited to a formal graduation ceremony. "That's the payoff," Jeanne said. "A rollicking reunion with Charys and a few hours to get to know her new partner. It was wonderful to meet Buster and Donna and to witness the bond between Buster and Charys." guide dog named "Yvette" at her side. The duo completed a month of intensive training at Guide Dogs for the Blind, Inc. in San Rafael, Calif. The graduation was Saturday, July 29, 2006 at the 11-acre campus, located 20 miles north of San Francisco. human-animal bond. These remarkable canines offer warm companionship, safe mobility and foster confidence and independence. During the course of training, skilled guide dogs and their new partners learn to negotiate stairways, elevators, overhead obstacles, crowded sidewalks and busy streets. The dogs are trained to avoid distractions and disobey commands to cross at streets if traffic is approaching. Guide Dogs for the Blind is a community dedicated to providing people who are blind with the opportunity to experience what a powerful partnership with a guide dog can mean not only to mobility, but to quality of life.The school is committed to matching each person with the right dog, developing a personalized training program matched to each person's lifestyle, and providing support services to establish a true lifelong partnership.